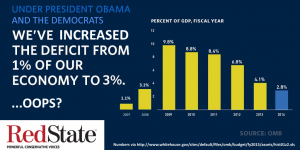 The White House and their false claims of deficit busting, in one handy picture. Short version: use this image against would-be Democratic deficit busters. IRS claims to have lost key Lois Lerner emails. The obligatory “Yeah, @barackobama remembers that politically awkward uncle after all” post. The White House confirmed on Thursday that President Obama had met his uncle, Onyango Obama, who was granted legal residency to the country this week — reversing a previous statement. The White House had previously told The Boston Globe that the president had never met his uncle, after Onyango — referred to as Omar — was arrested in 2011 for drunk driving. But White House press secretary Jay Carney revised that statement on Thursday, saying the press office had not actually asked the president about his relationship with his uncle before talking to the Globe in 2011. @BarackObama just keeps flat-out lying to his most loyal supporters on #obamacare. 2012 shaping up like 2004, on the Generic Congressional Ballot level. It shows the current pollsters checking the Generic Congressional Ballot, as per RCP. Most of the labels are self-explanatory: “R +/-” represents the amount by which Republicans are ahead/behind on any given poll. RCP’s current average is R+1.3, which represents a strong shift towards the Republicans in the last month among all three pollsters: 5 points for Rasmussen, 4 points for Politico, and 3 for NPR (although ‘shift’ is possibly the wrong word for the last one, given that there’s only been two polls). Five words with a hint of DOOM in them (Plus, a plug for the Transom). Those of you who subscribe to Ben Domenech’s Transom and read today’s (10/19/2012) edition will understand what I mean; those of you who don’t… well, subscribe already. #rsrh Looking at/for the partisan enthusiasm gap. “Fact checkers come to this with their own sets of thoughts and beliefs, and we’re not going to let our campaign be dictated by fact checkers,” he said. The fact-checkers — whose institutional rise has been a feature of the cycle — have “jumped the shark,” he added after the panel. …by The New Republic (!) is all very well, but it lacks one key phrase: “voting enthusiasm.” Which makes a certain amount of sense: dwelling on that topic might force one to come perilously close to turning a ‘the election is tied’ narrative into an ‘actually, Obama is more or less losing right now’ one. And we can’t have that. On that potentially troublesome Cook County poll. Well, troublesome for Barack Obama. The Daily Caller reported on a poll today that gave a rather remarkable result: it showed Barack Obama ahead of Mitt Romney 49 to 37… in Cook County, Illinois: which of course includes the City of Chicago. Being under 50% in what can be considered the ultimate Democratic stronghold is not good news for the President. In 2008 Cook County went for Obama over McCain 67/32; in 2010 it went for Quinn over Brady 54/40… which helped make the difference from Obama’s blowout 62/37 win statewide in 2008, and Quinn’s squeaker 47/46 win in 2010. Put another way: if this poll is accurate, Obama’s got trouble in Illinois. Since this report has been making the rounds of the Internet, I thought that I’d look into it a bit. It turns out the poll comes from McKeon & Associates, which has been polling in Illinois since at least the 1980s. A quick call to Michael McKeon got me access to the poll itself, which I’ll be talking about after the fold.